Click picture to enlarge! This is called a thumbnail! Although I'm not longer in the physical world, I gave all my knowledge while living on Earth to my best friend for the last nine years, Scott. He can help you make a website. He can make one for you even if you are on AOL. (That is worth a bark!) He can also make and place them on numerous "free" servers for you. If you want to view other websites made while I was still around and made while teaching Scott, go to: Nehoda's Backyard , Kendera Construction , Onan Generator . Scott's minimum charge is $75.00 for making a simple one page web page like this. It would include some commentary and five or six thumbnail pictures like mine above. More difficult web pages cost more and are sometimes hard to do! He can do them but at $75.00 an hr. It can get pretty darn costly! 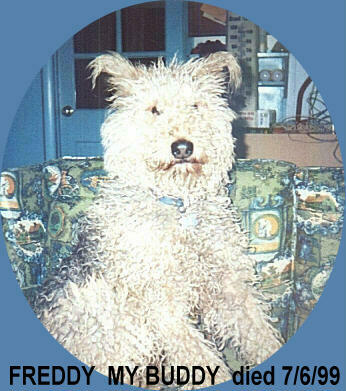 For most people who want to celebrate, birthdays, graduations, anniversaries, etc., and a tribute to their pets like my friend has, a simple one page website is nice. Celebrate the occasion!!! Get a web page, then tell all your friends you got one!